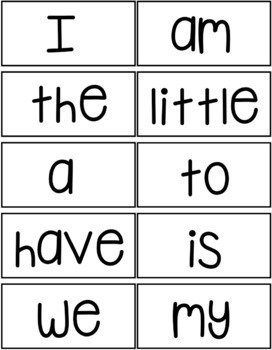 Want something portable for your students to practice sight words that they haven't mastered yet? Are some of your students done quick and need something while the others finish up? This Early Finisher Sight Word Folder is just what you need!! Whether you use this as an early finisher or a system to allow students to work on sight words at their own pace, you will find this helpful and super easy to use. This product is easy to print and assemble. I print these sight word folders on cardstock to ensure durability. 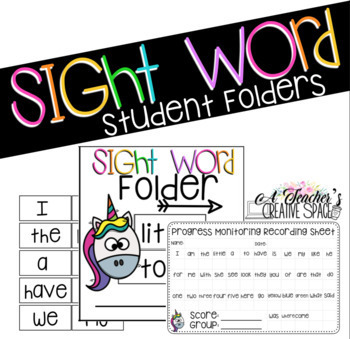 In the folder, there will be two pockets titled All Sight Words and Sight Words to Practice. All Sight Words is where I place all the sight words that I have taught. The Sight Words to Practice pocket is where I place the sight words that students need to practice. This sheet is a quick and easy checklist to progress monitor the students. I have the students take out their sight word cards and read them to me. I use this information to group my students for small group instruction. Kindergarten Sight Word Cards (I, am, the, little, a, to, have, is, we, my, like, he, for, me, with, she, see, look, they, you, of, are, that, do, one, two, three, four, five, here, go, yellow, blue, green, what, said, was, where, come) I also, provided a black card sheet that you can edit with your list of sight words. This file is EDITABLE and you can customize it with your own words!